Download this project and add it to your solution : http://code.msdn.microsoft.com/wpapps/Language-Neutral-Resource-5894846e. Edit the string table in the AppResLib.rc file to set your app name, etc. Change the values in the AppResLib.rc file for a specific language (for example french) and build again the project. 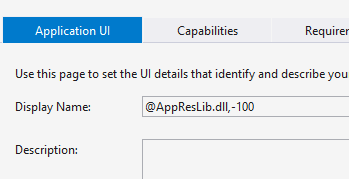 Select all the *.mui files and the AppResLib.dll file and set their build type to content in the properties Windows. Update your WMAppManifest.xml file and set the app name to this value : @AppResLib.dll,-100 . The value will then be taken for your file, depending of the user language, at the offset 100 in the string table. If you want to see this feature in action, it will soon be available in our last app “Say it With Flowers” !